When my eldest was in lower Primary, I assumed my child would easily excel in writing English compositions in school. Why wouldn't he? He has always been an avid reader, with a love for writing creative stories of his own. Besides, given the school's stellar past performance, I was confident his school teacher would do a fantastic job in teaching him. I could not be more wrong. Maybe the school teacher did her best, but it was not enough, as I realised weeks before my son's Primary 3 year-end-exam. The missing link was this - he was not taught how to write. Just given assignments and told to write with a few key words. He found the topics boring or something he had no experience with, so he did not write what he was 'supposed to write'. It was the same with Chinese. I gave my boy an intensive crash course on both English and Chinese composition writing. It worked better than I had expected when he came home beaming with pride with his 18/20 scores. I kept a more watchful eye on his writing assignments in the following two years and developed a programme to guide him in Primary 4 and 5. Since the school teachers did not, I had to! Though I toyed with the idea of sending to writing classes, but his upper-primary schedule was already so hectic without tuition (4 days ending at 4.30pm) that I could not bear the idea of more weekly classes. Besides, I do not believe in memorising compositions or cliche beginnings or overly dramatic descriptions. I want him to develop his own writing style. Despite my best intentions, we were both too busy to get down to regular writing. But I made it a point to do an intensive revision (i.e. 'crash course') just before the SA1 and SA2 and review/feedback every piece he did in school. I gave him 10x more suggestions and feedback than his school teachers did and when required, I got him to rewrite parts of the composition. Those that we did at home, we usually do a few drafts for each piece. Unlike in tuition classes where the kids get to write weekly, we did not do that at home. We wrote a few during the June and December holidays and probably one more piece in each school term. By sometime in Primary 5, he almost always scored between 32 and 35 out of 40 for both English and Chinese compositions. But more importantly, it has become increasingly obvious that he has developed his very own style. One of the best praises came from the English HOD who taught him in Pri 4 & 5. 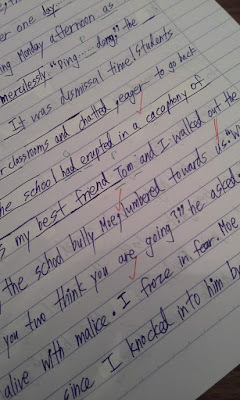 Mr T loved that M's pieces did not read like the typical pieces from the class. He has his own humour and points of view and writes in his own engaging manner, without all the tuition-styled-phrases. This year, in Primary 6, we did not do any writing at home at all. I figured he should be ready to be more independent. I continued to review his school pieces. They wrote only 5 for English and 10 for Chinese. I gave him tons of feedback again but did not ask him to rewrite. In the Prelim exam, he came home with 35/40 for both English and Chinese compo. We are both extremely pleased! To me, this is good enough. Sure, there are a handful who scored 36 or 37 and one who had 38/40 score for English. But these few all committed 2-3 hours a week for the last few years to writing classes or EL/CL tuition. From an efforts vs results perspective, I think my son did well enough. Saving hundreds of hours and only 1 to 3 marks short of the higher scorers. I always reflected on my teaching method after every lesson and major exams. No matter who/what I was teaching. The best outcomes to me in this case, is not just the actual score. What is more important is how he has learnt enough writing techniques to be confident of his own writing ability. By allowing him to explore and tell his own stories, with his choice of vocabulary (I would suggest but ultimately left him to decide), he fine-tuned his own writing style along the way. So, will this work for every child? My job of bridging my son's learning gap is made easier because he has a solid foundation in English since preschool. He is strong in Grammar and Vocabulary and at upper Primary level, I also did not have to guide him on Synthesis & Transformation. These strengths are undoubtedly useful in writing proper sentences and scoring above 16/20 in the Language component. He was not new to writing creatively before Primary 1 as a result of our lapbooking activities. So I just needed to identify his weaknesses and enlighten him with a strategy to make his content more interesting. Ta-da!! We had to work harder on Chinese but we managed it too, which gave me a MASSIVE sense of accomplishment. As far as I am concerned, I see it as mission accomplished. The PSLE is over and my boy is a confident writer in both languages. Now I shall redirect my focus to honing my middle child's writing skills and drive encourage him towards excellence!